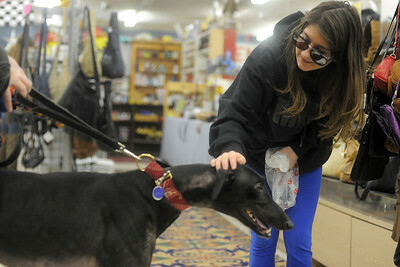 Maddie Robles,13, of Fox Lake,Il., pets Joe the greyhound during the 4 Greyhound Racers adoption drive at McHenry Flea Market Sunday, December 22,2013. 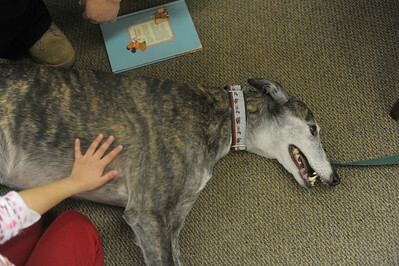 The event was to spread awareness and about 4 Greyhound Racers which helps find Greyhounds homes. Tania Fernandez, 6, of Wacaunda, Il. 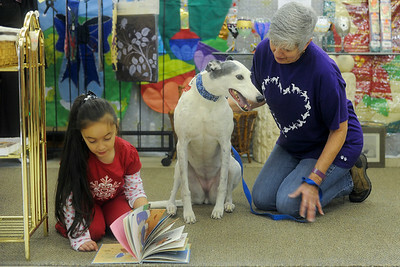 reads to Dixie the Greyhound and her owner Carole Hansen, of Power Lakes, Wis., during the 4 Greyhound Racers adoption drive. Dixie is trained therapy dog that travels to nursing homes and libriaies to have people read to her. " She doesn't judge if a kid is struggling while reading," says Hansen, "It's amazing to see the kids become better readers the more they read with Dixie." Jennifer Laughman, of Algonquin, Il, taked Millie the Greyhound out for a walk during the 4 Greyhound Racers adoption drive at McHenry flea market Sunday, December 22,2013. 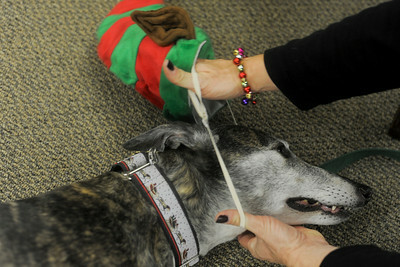 Jennifer Laughman, of Algonquin, Il, puts an elf hat on Millie the Greyhound during the 4 Greyhound Racers adoption drive at McHenry flea market Sunday, December 22,2013. Tania Fernandez, 6, of Wacaunda, Il. pets Millie the Greyhound during the 4 Greyhound Racers adoption drive at McHenry flea market Sunday, December 22,2013.